This boat is a great ‘first boat’ and was decked out by its original owner with alot of gear. 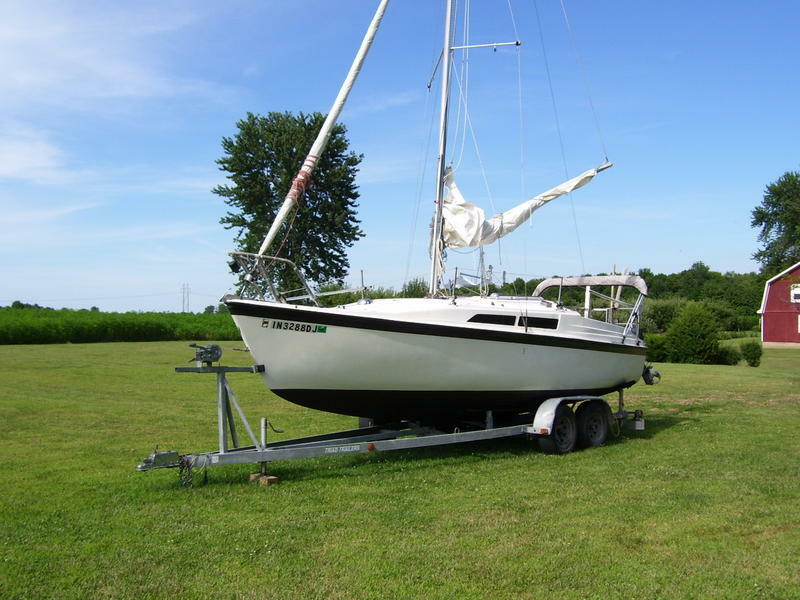 I have used it on a local lake as a ‘day sailer.’ In order to get in and out of the marina slip easier, I purchased a ‘Power Tiller’ and linkage for this motor. It has 2 levers that attach to the tiller allowing you to switch to forward or reverse while also controlling the throttle from the tiller. The entire package is still new in box. The boat comes with a bimini top, pop-top that provides standing headroom while at anchor, roller furler, Simrad tiller pilot, new bottom paint (2011), Triad dual axle trailer, enclosed head, etc. I’ve got plenty of pictures to email to you if you like. The Power Tiller will be a great add-on that cost more than $600, but was not added on yet as I just purchased a Flicka. The boat is on its trailer and ready to roll – and since my new boat is here, I need to sell this asap! Asking $9900. Power Tiller! Lavac marine enclosed head! lots of misc. items that I never used.